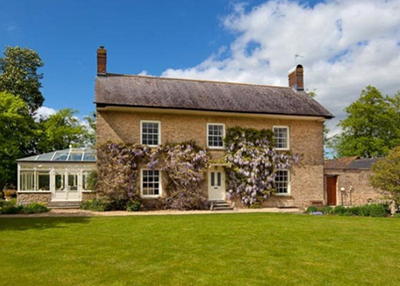 Mount Pleasant Farmhouse is an Grade II listed former farmhouse in Oxfordshire believed to date back to 1790, which has been recently remodelled with careful attention to retain the period features and character of the original. It now offers charming accommodation with elegant reception rooms with high ceilings, fireplaces and wide sash windows with working shutters. The ground floor accommodation provides excellent family living and entertaining space with three spacious reception rooms, each with fireplaces, an impressive conservatory and a large welcoming kitchen/breakfast/family room. The drawing room and sitting room are divided by folding doors providing the flexibility to be opened into one room – perfect for entertaining. The drawing room has a fine hand carved fireplace surround with a woodburning stove, whilst the sitting room has a vast open inglenook fireplace. Leading off the sitting room, facing south/west, is the spacious conservatory. Forming the hub of the house is the oak floored kitchen/breakfast room with a notable large island unit. The substantial master bedroom suite is located on the first floor, as are two further en-suite double bedrooms. The second floor provides a perfect area for children/teenagers with three charming bedrooms and a further bathroom. The third bedroom on this floor is currently used as a storage room but would also form a perfect cinema/playroom. Outside are attractive landscaped gardens, a tennis court and a heated swimming pool. The single-storey cottage is currently used as an office with separate recreation room (with sauna, shower and hot tub) but could be put to a number of uses. There is also a stable block and paddock land amounting to nearly eight acres. Arranged behind the cottage are the stables (currently used for storage and housing the pool filtration system and boiler); the paddock land lies to the rear of the house. Mount Pleasant Farmhouse is situated approximately 14 miles south west of Oxford in a beautiful rural setting with wonderful views of the surrounding countryside and to the Ridgeway. The attractive village of Buckland is close by with its parish church and it’s extremely well placed for some of the best schools in the country including St Hugh’s, Chandlings, and Cothill as well as the Abingdon and Oxford schools – notably Radley, St Edward’s, Magdalen College School, Headington, Oxford High and Abingdon School. The guide price is £2.45m. For further information please contact Savills on 01865 339 700 or visit the house on their website.